On Saturday Morning I took a tour of Vatican City. Vatican City is the smallest state on earth, it covers only 440,000 square meters! The Vatican Museum was too big for me to see everything but what I did see was breathtaking. 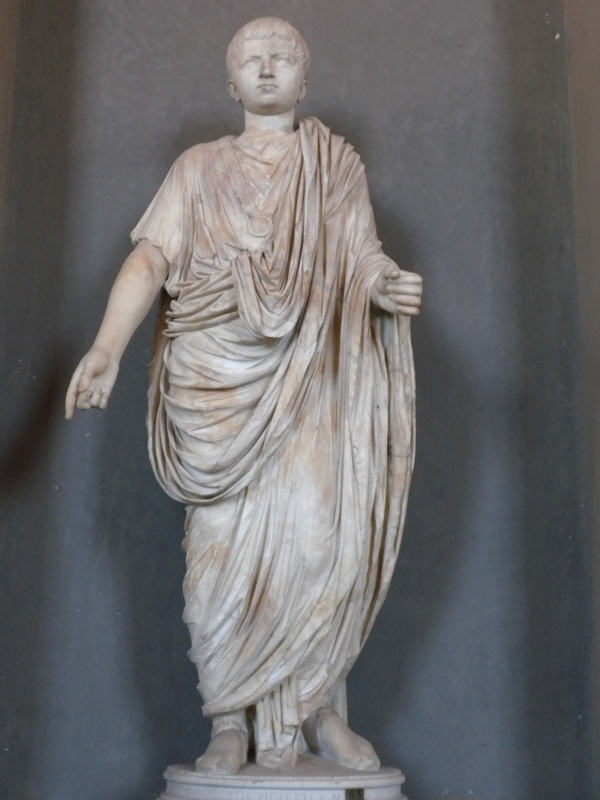 The museum has a fantastic collection of statues from all over the world. 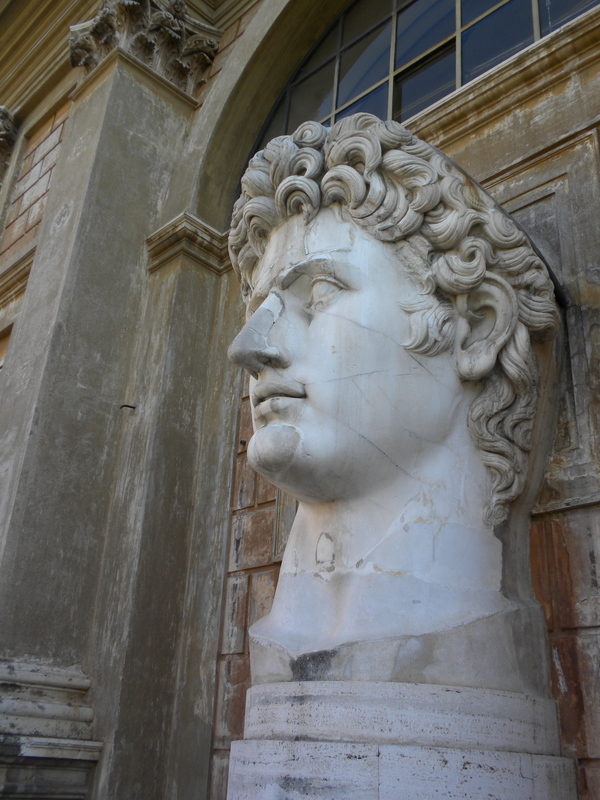 This statue in the courtyard is the bust of Augustus, the first Emperor of Rome. You can’t tell from the picture but this thing is huge. Standing next to this bust, an adult would barely clear the base, that is how big this thing is! I thought this statue was cool because it still has the eyes painted on. Apparently most of the statues were painted, but the paint has long since worn off. This is another painted statue, and you can still see remnants of the paint if you look closely. My favorite part of the Vatican tour was seeing the Raphael Rooms. The Raphael Rooms are four beautifully frescoed rooms that made up the Papal apartments. 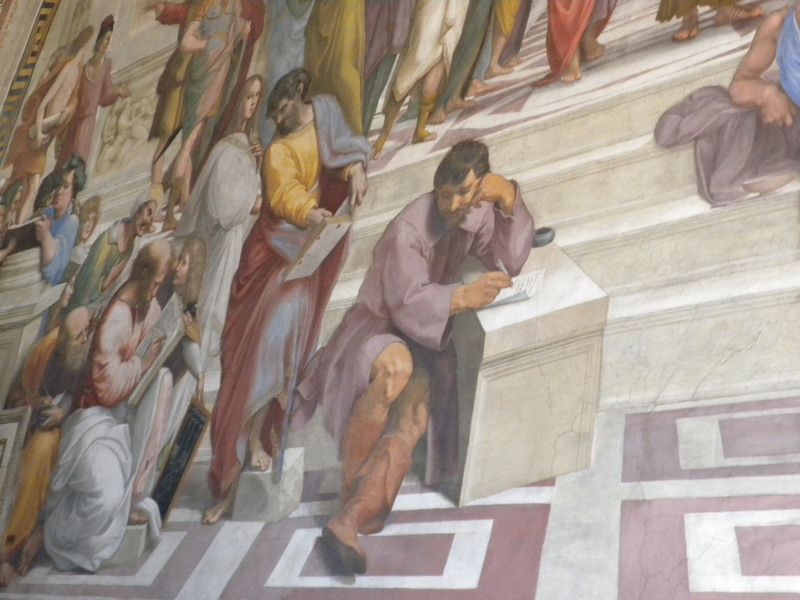 The most famous of these frescos is in the Signature Room, titled School Of Athens. School Of Athens stars Plato and Aristotle. Plato is pointing towards the sky to symbolize the world of ideas, and Aristotle motions toward the ground, symbolizing the world of reason. Raphael actually used Leonardo di Vinci’s likeness as the model for Plato. 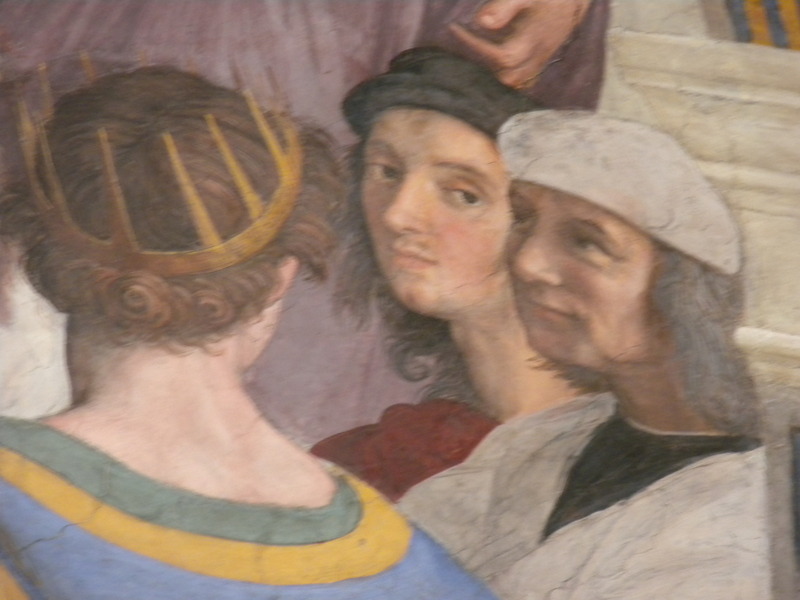 Leonardo is not the only famous painter to make an appearance in School of Athens; Raphael painted himself as a bystander in the bottom right corner of the fresco (the guy looking out at you in the green cap), and his girlfriend in the bottom left hand corner (the girl in white looking at you). One very interesting thing I didnt know before the tour was that Raphael and Michelangelo not only knew each other, they worked on their famous masterpieces in Vatican City at the same time. Apparently they were polar opposites, Raphael was outgoing and jovial (and loved the ladies), and Michelangelo was withdrawn and serious. 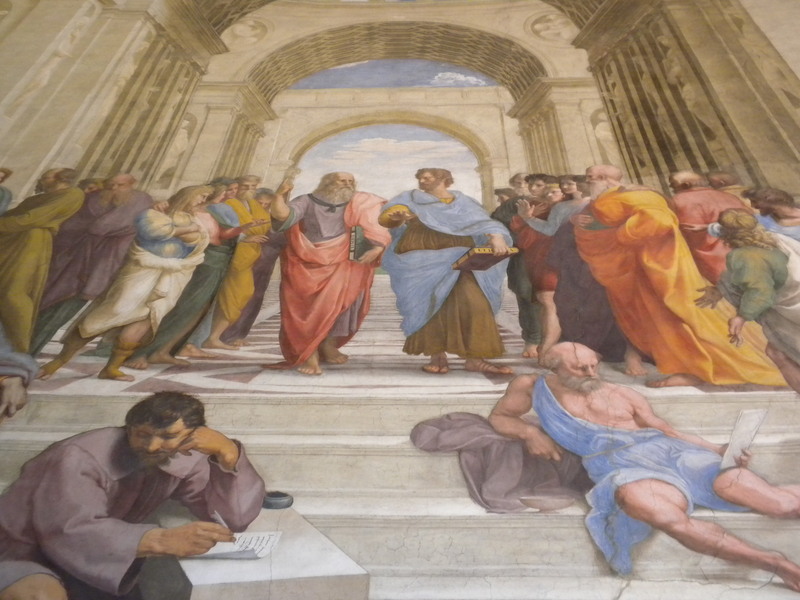 Legend has it that after Michelangelo finished the ceiling of the Sistine Chapel and it was unveiled, Raphael was so blown away that he rushed back to the Papal Apartments and added Michelangelo’s likeness to the School of Athens (he is the seated dark haired guy wearing a purplish tunic in the above picture). The Sistine Chapel was even more beautiful than I expected. It took Michelangelo four years to complete the ceiling, and another five years to complete The Last Judgement on the front wall. No pictures were allowed in the Sistine Chapel but here is a cool link to get a 360 degree view of the chapel, you can even zoom in to see the details! 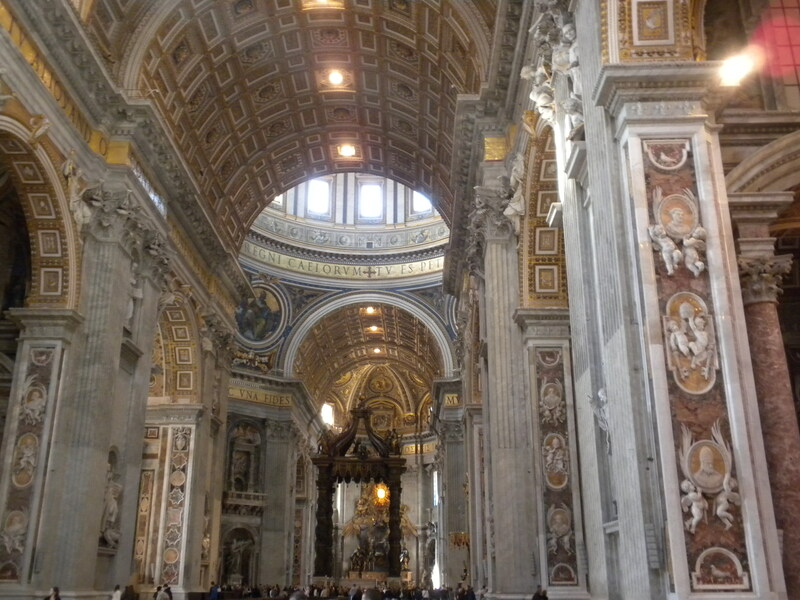 St. Peter’s Basilica is enormous! 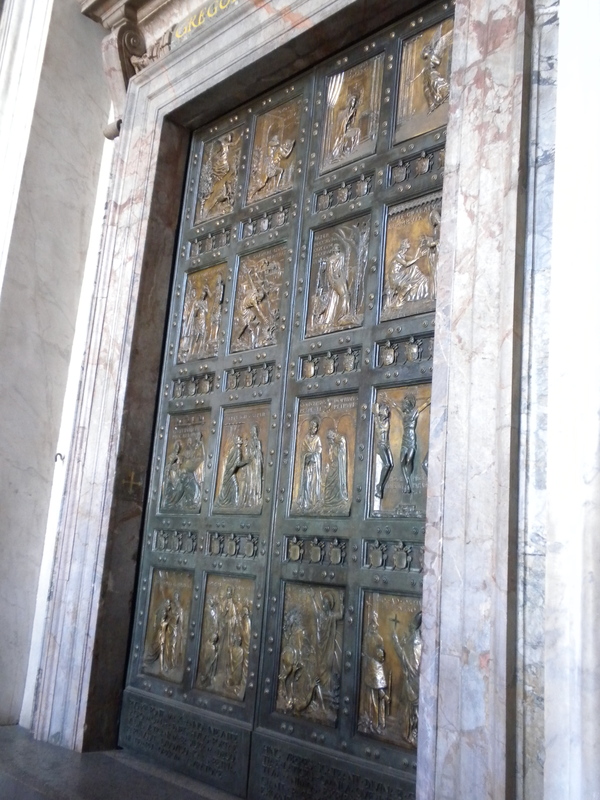 This bronze door (called the Holy Door, or Porta Sancta) is cemented closed, and only opened every 25 years during the Holy Year (the last time was 2000). According to Catholic Tradition if you pass through the Porta Sancta you will be granted an indulgence. 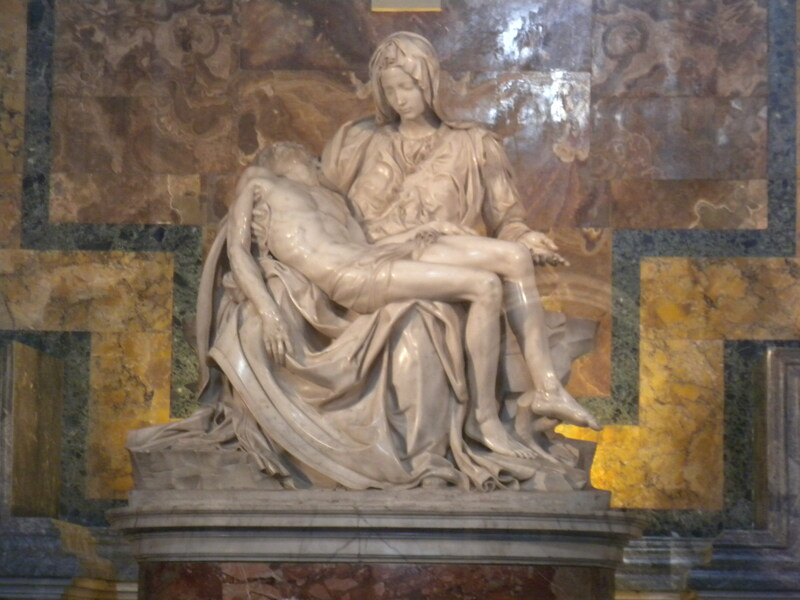 One of the only pieces signed by Michelangelo is his beautiful sculpture Pieta, depicting the Virgin Mary holding the body of Jesus. The story goes that Michelangelo was so outraged that people were giving another artist credit for this sculpture that he carved his name on Mary’s sash, right in front. Allegedly he later regretted carving his name on her sash and did not sign his pieces anymore. So those are the highlights of my Vatican City tour. If you have a chance to take the tour please do! The artwork in the museum and Basilica was mind-blowing! 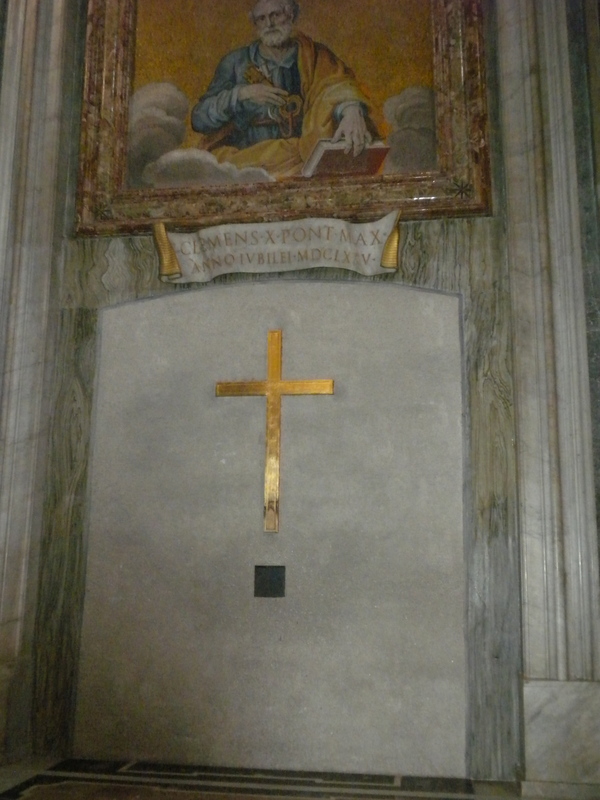 This entry was posted in Uncategorized and tagged 35 Before 35, Churches, Italy, Rome, Travel. Bookmark the permalink. What a great adventure! Your pictures are wonderful!